I have been taking Pilates classes once a week for one year at Evergreen Pilates, and my results have been dramatic. Applying my new understanding of "core" muscles has improved my golf swing speed by 10-12% and has allowed me to swing with greater ease and consistency. Pilates has become a popular path to strength and flexibility, boasting more than 10 million American practitioners. Combining her love of Pilates and outdoor sports, seasonal instructor Lauri Ann Stricker has penned a user-friendly guide to boost performance, prevent injury, and increase longevity. By following her simple 15-minutes-a-day program, athletes of all abilities will be able to paddle, bike, hike, climb, ski, and run at the top of their game. This book will empower you to do Pilates safely and effectively with cross-training routines specifically for your sport. Now available at the studio and online. 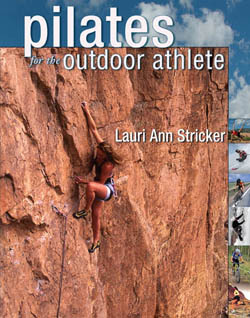 Evergreen Pilates' owner Lauri Stricker's long awaited book Pilates for the Outdoor Athlete (Fulcrum 2006). © 2012 Lauri Ann Stricker. All rights reserved. Site developed by bluetrope.